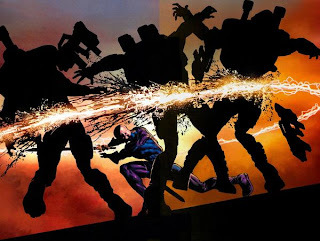 The Newest Rant: Flashback Friday--Warren Ellis on Thunderbolts. 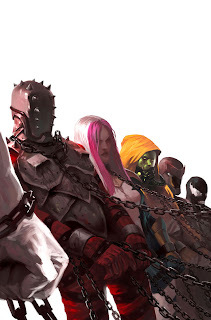 After the Civil War event-comic Marvel did the world had changed. Super-heroes had to register their identities or be breaking the law, and it led to various conflicts. The problem with this idea of putting super-heroes on a government payroll is it also meant that the crazy villains could hop on the gravy train too, and warp public opinion so as to think they were heroes. 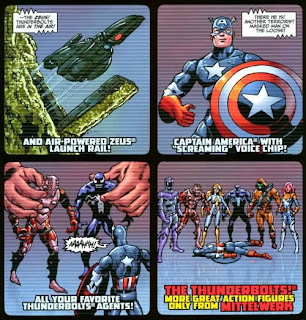 Hence, the concept of Warren Ellis' short but amazing twelve-issue run of Thunderbolts. Separated into two volumes, the first is about the dynamics of this dysfunctional team. 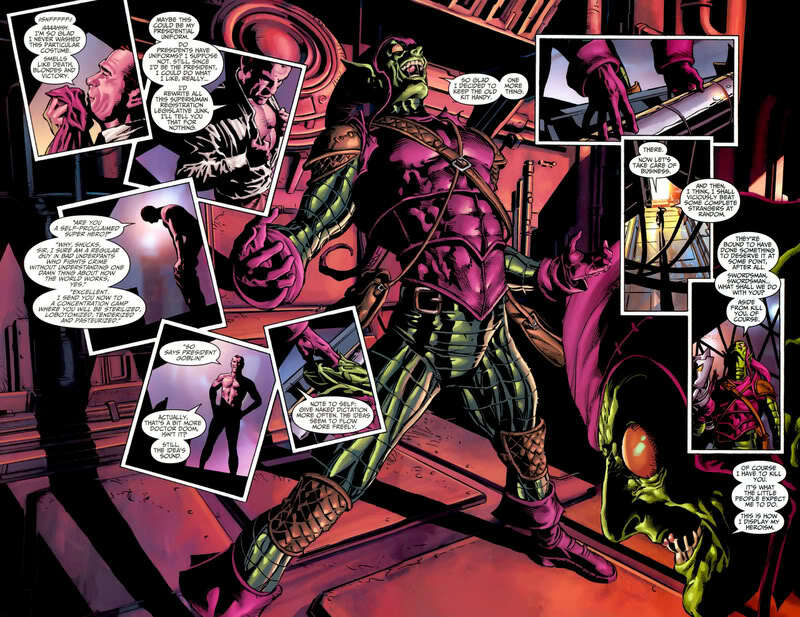 You have Bullseye, Venom, Penance, Swordsman, Moonstone, Songbird, and The Radioactive Man (although the last two weren't all bad) and leading this team you have one of the craziest men around, Norman Osborn. How could this comic have been anything but a masterpiece? Plus you have pundits arguing about whether these registered heroes are a police-type group or a whole new kind of fighting force within the country. Ellis also has some characters make valid points about the whole Marvel Civil War, with two characters discussing registration as being, "making the skies safe for flying whitey," and it being no coincidence, "...that it was the biggest black guy in the world who they chose to kill first," which is a bit of a meta-textual reference to the infamous scene in Civil War I have discussed on my blog before. There is plenty of action and other great introspective scenes in the first volume, but stuff doesn't get really crazy until the second. Known super-hero psychiatrist Leonard Samson also shows up and has some great scenes with Penance AKA Robbie Baldwin--the guy whose group of super-heroes was responsible for a disaster that led to super-hero registration in the first place. The tense scenes between Samson and Baldwin are probably my favorite of the book, with the Doc analyzing Baldwin and making some good points about the character. 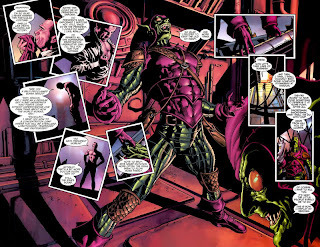 My absolute favorite scene in Ellis' run however had to be when Norman Osborn finally decides to put on his Green Goblin costume and delivers one of the craziest monologues out loud to himself ever put to paper. Touching on everything from his disdain of super-heroes (a concept Ellis--who has mocked super-hero comics before--works into this series at various points) to how someday he's going to run the country, which during the Dark Reign event he sort of did, this is one glorious essay of a madman. This run on the series by Warren Ellis is probably among my favorite comics of all time, up there with New X-Men by Grant Morrison. Ellis took a Marvel event and delivered a rumination on politics, what it means to be a super-hero or super-villain, and worked in some great dark humor too. This is one of the finest pieces Ellis has produced and you have got to check it out even if you don't normally read Marvel comics. 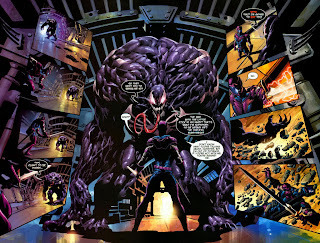 After all, this was so great and so popular Marvel pretty much took the concept to zany levels with Dark Reign--but having Osborn in charge worked better on this small scale and makes for some highly-enjoyable reading. 5 out of 5 stars (for the overall series). Thunderbolts by Warren Ellis, Vol. 1: Faith in Monsters (v. 1) for the great start. Thunderbolts, Vol. 2: Caged Angels (v. 2) for the incredible finish. Please Note: Volume 1 includes some other comic material like a one-shot focusing on Penance and Bullseye, or Venom being recruited to the Thunderbolts, but other than a short piece written by Ellis these are pretty unimportant and none too impressive so I just ignored them.